Photo by Marty Cheek Several members of the Gavilan Community College Drama Department's cast of "A Midsummer Night's Dream" perform a comic scene for third-graders at Barrett Elementary School in Morgan Hill. 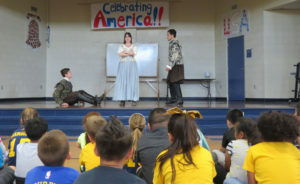 Several members of the Gavilan Community College Drama Department’s cast of “A Midsummer Night’s Dream” perform a comic scene for third-graders at Barrett Elementary School in Morgan Hill. The students sat cross-legged on the floor in front of the multi-purpose room stage, laughing at the actors’ antics. Acevedo recalled performing on the stage at Barrett as a child. Monday, April 23, the Bard’s birthday, brought her back to share a love of theater with the next generation of school children. She performed as Hermia, the young Athenian woman caught in a comical romantic entanglement where she loves one man, Lysander (played by David Pequeño, but is being courted by another, Demetrius (played by Tyler Hudson), whose feelings she does not return. Gavilan actress Chelsea Simmons performed as Helena, who is love-sick for Demetrius, who, because of magical potion, spurns her affections. 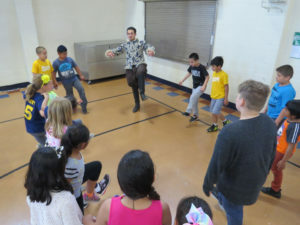 “A Midsummer Night’s Dream” actor David Pequeno instructs students in theater games. Earlier in the workshop, the students learned from the play’s director, John Lawton Haehl, the secret to the poetic beats known as iambic pentameter. He showed them how William Shakespeare’s use of cadence of words imitated the rhythm of the human heartbeat. He read to them Sonnet 18, Shakespeare’s most famous poem, and had them beat out the rhythm of each syllable on their chests. 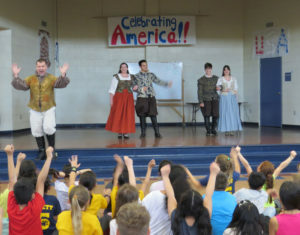 Lawton Haehl believes it will benefit the third-graders later in their academic endeavors to introduce them to Shakespeare early so they won’t later as freshmen and sophomores be intimidated by the non-modern words and phrases used in his play. Introducing young people early to theater helps them appreciate the magic of the stage and might even inspire them to consider performing as actors, Acevedo said. And growing an appreciation of Shakespeare and his world of words in the third-graders was the goal of Celebrate Shakespeare! “Midsummer Night’s” length at two hours (including an intermission) and its slap-stick comedy and clever poetic word play make it an easy play for a first-time viewing of Shakespeare. “Oh, my gosh, it was so enjoyable and such a treat. There’s nothing like performing for kids. 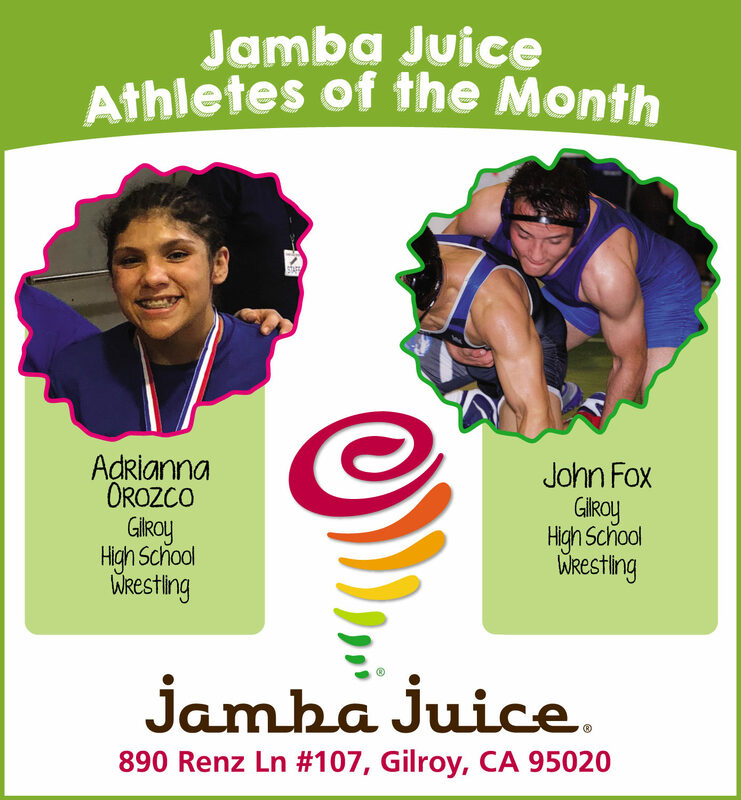 It’s a different type of experience and it’s just such a blessing,” she said. After the scene was performed, the students were divided into four groups and led by each of the actors in games that helped them develop their stage movements and dramatic voices. Simmons encouraged parents to take their children to see the Gavilan production, which opens May 4. To encourage families to come, a special ticket package is offered at $35 for two adults and two children. Pequeño compared performing in Shakespeare to the athleticism of sports. Hudson, as the Athenian Demetrius, was impressed by how quickly the third-graders began to appreciate the genius of Shakespeare, the first time most of them had ever been exposed to the playwright poet. For Lawton Haehl, Celebrate Shakespeare! 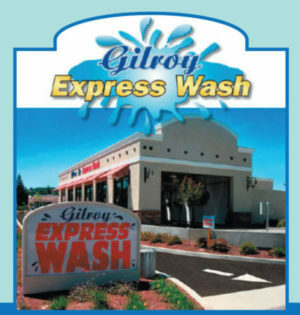 served as a successful experiment in how young minds can learn the complexities of the Elizabethan style of word usage.